Some people rescue dogs: old, young, abused, abandoned, incorrigible, lost, or otherwise rejected. I admire those rescuers, both for their compassion and for their willingness to dedicate a significant amount of time and resources to restoring an animal’s security. I’ve rescued a few cats over the years, including the current one, who has never, in her 13 years, been able to decide if she wants in or out. Mainly though, I rescue plants. There is less care involved and, if they totally fail to revive, I don’t have a guilty conscience over tossing them into the trash can. Summer is the time of year I go into full rescue mode. Although the savings are significant, that’s not the real reason I gather scraggly, wilted plants from clearance tables–preventing them from being thrown out by the garden store or market vendor. Perhaps I’m influenced by the advice my parents gave me, “Don’t discard anything that’s “still good.” However, I have a more compelling reason for hauling home half-dead plants every year. It’s the challenge. Can I revive this plant? Will it flourish? Surprisingly, nearly all of them do. They are tenacious; I love that about them. 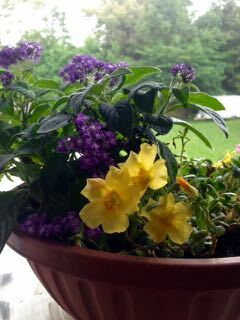 My kitchen window sports a large pot full of blooms. 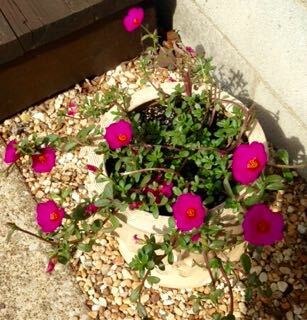 An outdoor container has moss roses spreading their vivid color, and a geranium outside the kitchen door is doing it’s best to produce a flower cluster now and then. I also have a hard drive loaded with short stories, both partial and complete. Add to those the completed manuscript of a novel I’ve decided to revive, numerous essays, some creative-nonfiction pieces, and assorted poems. Some were rejected; some never submitted. A number of them are uneven, rough, or outdated. The question? Are they worth rescuing? During an NPR interview with Nora Roberts in which Peter Sagal asked her if she ever experienced writer’s block. Did she ever run out of ideas? She told him, “Oh, no. There are 88 keys on the piano, but do you run out of music?” I couldn’t stop thinking about that answer, because why not rescue bits and pieces of our writing and give them a second chance in a different form. If you are one of those incredibly talented–or just damn lucky–people who haven’t garnered a collection of rejection slips, I applaud (and definitely envy) you. But, if you have, like many writers I know, felt the despair of defeat a few times, then consider my rescue theory. Maybe that novel, story, essay, or poem isn’t dead; it doesn’t need to gather digital dust in your documents folder. Treat it like the dog, cat, or plant that’s been given another chance to thrive. Your work may fit into a different genre than you thought it did. It may require tweaking to make it age appropriate, or interest a slightly different audience, but that usually doesn’t require an extensive rewrite. Maybe it just need to be condensed to fit current publishing guidelines, or expanded to enhance your overall theme. Sometimes all it takes is a shift in chronology to appeal to the contemporary reader. A nod to the pervasiveness of social media might suffice. Changing the titles of the songs your characters listen to; upgrading the model of car they drive; modernizing their language, including slang, can make your work seem fresh and new. Even recognizing current concerns–economics, politics, the environment–can revive a moribund manuscript. The publishing market for genre changes as well. For a while, memoirs were in demand, then they were glut on the market. With the advent of reality shows, there is still a market for good memoirs that have a universal theme. A former adult novel may now be suitable for YA with few changes. Dystopian fiction, ignored by publishers in the past, may be highly relevant in 2017. I hope you root around in your file drawer, or on your computer, and find something wonderful you forgot you wrote.